Palmetto Mini Golf offers safe family fun in a beautiful setting The 18-hole course has waterfalls, lagoons, and a cave, all among lush landscaping from around the world. All age groups and all levels of athletic ability can enjoy the game of miniature golf. Whether a fun teen night out, a relaxing afternoon for seniors, or maybe a birthday party for a family member – it’s sure to be an enjoyable outdoor experience. The place to be for Mini Golf in Miami. 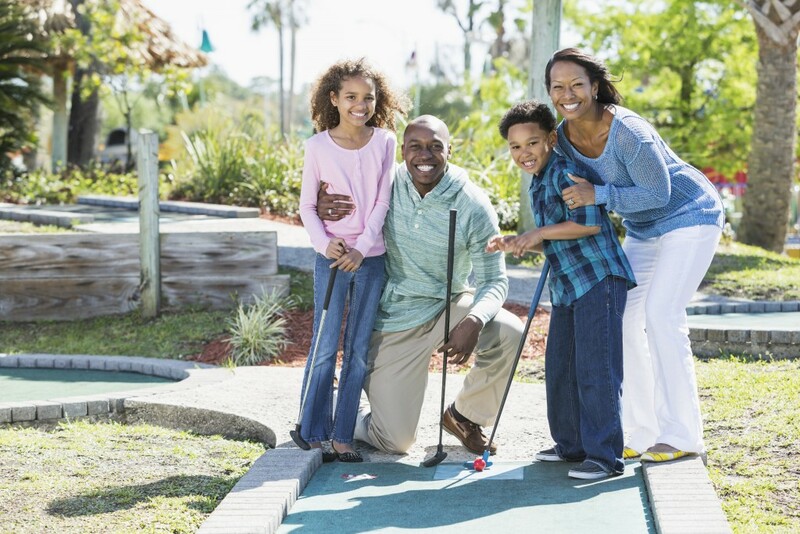 Celebrate that special someone’s day here at Palmetto Mini Golf. Our on-site restaurant, Sports Grill, has a birthday menu the kids will love. Our outside covered deck is available to accommodate your party needs. Looking to make some money for your school, organization, group or charity? Palmetto Mini Golf is the perfect way. Affordable fees allow you to maximize your fundraising potential. During the summer, area camps may schedule field trips at Palmetto Mini Golf. We suggest giving the pro shop a call at 305-238-2922 before your daytime visit.